Arthur Selwyn Elvy was born 7 March 1875 at Shepherd Street, Darlington, the son of William Elvy and Jane Read Hydaspes Worsley. He married (1) Mary Florene Fisk (1879-1933) 10 January 1900 at St Albans Church of England Golden Grove, NSW, and they had five sons and a daughter. He married (2) Loretta Martha Bohlsen (1908-93) 1 July 1936 at the District Registrar’s Office, Redfern, NSW. Arthur Selwyn Elvy died 19 July 1949, aged 74 years, at his residence ‘Selwyn’ 20 Winchcombe Avenue, Haberfield, NSW, and he was interred in the Church of England Section at Rookwood Cemetery. He left a Will and his estate and assets were valued at £8,360. Earlier, Elvy lived at the family home ‘Boronia’ at 141 Rose Street, Darlington. Elvy’s family butcher shop at the corner of Codrington and Rose Streets, Darlington, was run by the family for three generations; the building was demolished in 1971 to make way for Sydney University. In time Arthur Selwyn Elvy accumulated four butcher shops and various properties which he ran as a family business with his sons. With the sacrifice of many Darlington residents in World War 1, the council commissioned a Roll of Honour for the Darlington Town Hall, which was unveiled by Mayor Elvy on 16 March 1918 with Governor General Ronald Munro Ferguson. Arthur Selwyn Elvy was the president of the Darlington Aid Society which gave aid to the relatives of local soldiers, besides supporting the Red Cross. Mayor Elvy in 1919 said Darlington had taken a prominent part in all patriotic movements and has sent 256 men to the Front. For many years he was a vice-president of the Metropolitan Band, the senior organised band in Sydney in the 1920s. He was a justice of the peace (JP). In recognition of Arthur Selwyn Elvy’s contributions, Elvy Lane Newtown, was named in his honour. Arthur Selwyn Elvy was an alderman on Darlington Council in 1903-48. He was mayor of Darlington in 1916-19, 1922-24, 1926, 1930, 1932-37 and 1941-43. 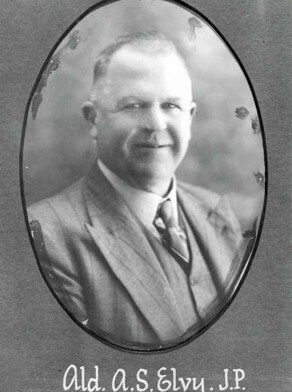 He was also elected an alderman on Newtown Council in 1938-40 and 1944-48, representing Enmore Ward. His father William, brother Albert and son Harold were also aldermen on Darlington Council, along with his brother in law James Pope Melville.